Being a Google developed OS on the Android phone, as you can imagine there is excellent support for Google Apps such as Maps, Voice, Search and even Sky Maps! The rest of the apps are divided into categories, so there are plenty of ways of narrowing down your searches, and they have a nice “Just In” category so you can see what’s being added on a daily basis. There are also a number of great sites where you can set up an RSS feed to get them hot off the press. I’d recommend for any Smartphone user that you have a look at www. appboy.com which list new applications for iPhone and Android, among others. I won’t bore you with a list of what’s available, the fun is in the discovery, but suffice to say you won’t be disappointed. On a recent trip to Cyprus I was particularly impressed with a “Bars and Clubs” application that takes your location from GPS and tells you bars, clubs, restaurants, etc. at nearby locations. Truly a worthwhile application and one into which I’ll be happy to feed some new entries! There are lots of games as well if you are that way inclined, and if you’re wondering about whether or not your want to dump your Blackberry, there are Exchange tools out there to allow you to pick up your business mail, or you can install the Gmail app and handle your mail yourself. And finally, Opera Mini. If you are on a limited data plan, you MUST download this app at once! Opera Mini, the smartphone version of its big desktop brother, is a fast, free browser that, while it does have the occasional rendering problem, will save you a fortune if you pay your phone provider by the megabyte. Opera very kindly take any web page you request and compress it before they send it to you, resulting in a much smaller (and cheaper!) download. This shaved about 80% off my pay-per-megabyte data bill, despite the fact that I use a lot of PDA ready sites which are already low in graphics and other bandwidth-consuming content. I’ll cover PDA friendly sites in another article, as there are plenty out there and it really is a must to have lightweight web sites on mobile phones, if only because of the screen size and the time it takes to load a page, even if you are on an unlimited data package. If you have any specific questions on Android, please don’t hesitate to write to me at thecomputer [email protected] and I’ll be happy to answer them. Similarly, if you have other questions on any computer or technology-related subject, please feel free to email me and I’ll have a crack at it for you. I’m planning forthcoming articles on Home Networking, Multimedia players, PDA sites and others, but if you have a subject you feel merits some column inches, fire away and I’ll gladly take on the challenge. This time last year, and with a review in this newspaper last June headed Fireworks Fast and Furious, Thaya Kongpakpaisarn stunned a capacity audience at Payap University with an electrifying piano recital that has had the audience talking ever since. He is now nineteen years old and has just completed the first year of his studies in music at the prestigious Eastman School of Music in Rochester, New York. 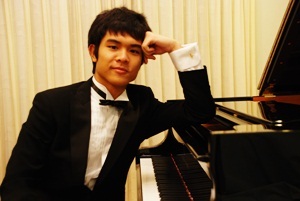 He is returning to Chiang Mai in June from his home in Bangkok during his summer vacation and will be playing two exciting recitals at the invitation of the Friends of the Chiang Mai Music Festival. Thaya Kongpakpaisarn, one of Thailand’s rising musical stars. Thaya has had a good first year at Eastman despite what he called a ‘horrible load of winter weather’! He is there on a scholarship while studying at Mahidol University in Bangkok which he has attended since he was 16 after leaving a bi-lingual state secondary school near to his home. Learning to play the piano from the age of 6, he is one of Thailand’s great rising musical stars. He has a lightness of touch that brings out the beauty of the romantic composers; he has a firm grasp of the nuances of the classical composers as well as their energy and drive. With more modern works, he excels as he feels many of them are a challenge to him as the player and a challenge to the audience as listeners – his aim is to achieve both challenges by enlightening the audience and by giving a moving performance. He certainly did that when he appeared in Chiang Mai last year and we look forward to these two exclusive recitals shortly. Reservations for a limited number of guest seats for both performances can be made by telephoning JP on 084868 1017. Tickets are 300 baht for the Friday evening with light refreshments after the recital and 200 baht for the matinee when students from the Northern School for the Blind have been invited as special guests. These are Thaya’s only two planned recitals in Chiang Mai this year so please book early.